July 2, 2013 by Verle L. Bell, M.D. What is FREEDOM? Think with me: if I want to know what God thinks, and if I am humble, I will ask a simple question and get pretty close to the God’s answer every time. The question is “What do I think, what seems logical and comfortable to me? And what would the opposite of my thinking look like? Fill in the details and I will be close. In me, that is in my flesh, dwells no good thing. I would like FREEDOM to mean that I would have the ability to do whatever I like, whenever I like, with whomever I like, eat whatever I like, go wherever I like. No one would tell me NO! Sounds like a two year old, right? Failing this, I wish I could have just a few rules and regulations that would keep some order in the universe but still leave me large swaths of my time and resources to do whatever I want. Maybe I’ll give 10% to God and then the rest is mine to do whatever I like, right? 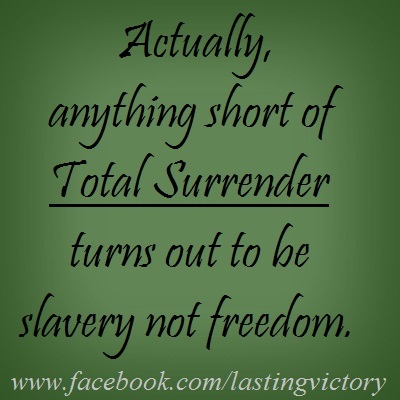 Actually, anything short of total surrender turns out to be slavery not freedom. When I indulge myself in the delusion that I control something and it serves me and exists to satisfy me, at that moment these gods that I erect in my life turn on me and control and own me rather than the other way around. FREEDOM = is the power to do what is right while retaining the power to do wrong. Free will means that I have to power to refuse obedience at any time but to have the power to do what is right I need God and others. The path to FREEDOM (think equal and opposite) is to become a slave. Having been bought on the slave-block of sin by the infinite price of Jesus’ blood, logically I should present my body a living sacrifice unto God. If he owns me, he owns my time, my family, my reputation, my job, my hobbies and leisure activities, etc. Free at last, thank God almighty, I’m free at last! Free from fear of loss of relationships- they are only loaned to me and if lost I still have all I need in Jesus. I asked God for strength, that I might achieve, I was made weak, that I might learn humbly to obey. I asked for health, that I might do greater things, I was given infirmity, that I might do better things…. I asked for riches, that I might be happy, I was given poverty, that I might be wise…. I asked for power, that I might have the praise of men, I was given weakness, that I might feel the need of God…. I asked for all things, that I might enjoy life, I was given life, that I might enjoy all things…. This entry was posted in Uncategorized and tagged BIBLE WORDS EXPLAINED, faith, freedom, God, Jesus, Slavery. Bookmark the permalink. When I read this post of yours on Freedom I get depressed, scared, and feel hopeless. I just want to give up because it seems so hard. A horrible existence. I am not criticizing your post. I think you are right on with what you say and please don’t let my response discourage you. But when I read it, my mind goes dark and I just want to give up. It’s all so overwhelming.